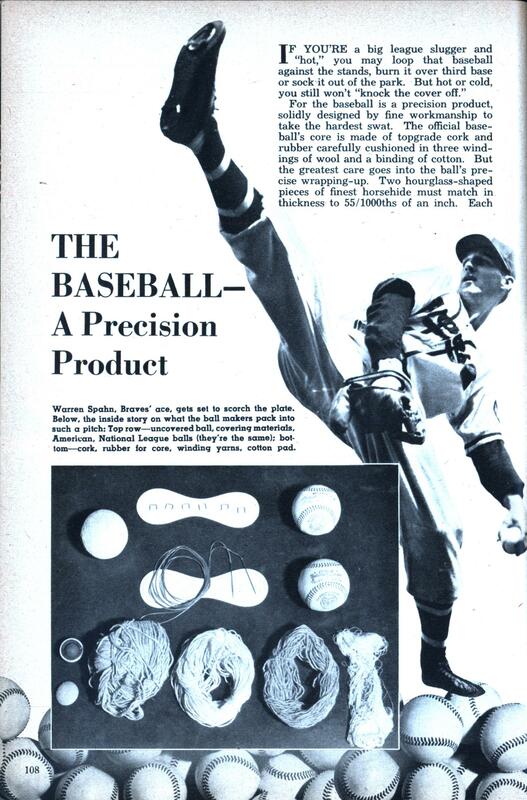 For the baseball is a precision product, solidly designed by fine workmanship to take the hardest swat. The official baseball’s core is made of topgrade cork and rubber carefully cushioned in three windings of wool and a binding of cotton. But the greatest care goes into the ball’s precise wrapping-up. Two hourglass-shaped pieces of finest horsehide must match in thickness to 55/1000ths of an inch. Each ball must get exactly 108 hand stitches. Edward Hubbert has put Perkasie, Pa., in every big ball game. Thirty years ago he moved to Perkasie and began covering baseballs in his kitchen. Today 200 of the town’s 4,100 people help him “cover” baseball so precisely that even a Ted Williams can’t wallop “the Perkasie” off that pill.